It is time for another LitFuse Blog Tour... this one is for the book Live to Give by Austin Gutwein. I love books that I can hand to my teen to read, and I especially love books that are written by sincere, Christian male teens or young adults. This book is that. Connor keeps vanishing with my Kindle so that he can read more. But then he keeps reappearing, because he just feels compelled to share what he is reading. Connor's take: "I love the analogies he uses, and how he is always quoting appropriate scripture. Yet he still keeps throwing in all these personal bits, so I feel like I really know him. It's almost like having a conversation, though I try to come out here and talk to you instead of talking to this gadget." I asked Connor what ages he thinks this book is appropriate for, as I was thinking it would definitely be good for William (13) to read, and maybe Thomas (11). Connor didn't hesitate. He said, "This is good for all ages. I think Trina [age 6] would be able to listen to it and benefit from it. I think Dad would learn a lot." Now, I'm not planning to read this aloud to my young elementary students, but I will be having my tween and young teen read it too. I do think this is a book that every teen should read. 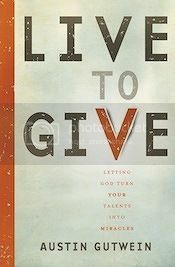 See what other people are saying about Live to Give. And there is a giveaway happening very soon. If we were to win, we'd give the book copies away to some young men at Scouts, and the donation would go to a nearby food pantry, as fighting rural hunger is Connor's hot-button issue.